The next time you are in the mood to treat yourself to a gourmet sandwich that won’t break the bank (or your belt! 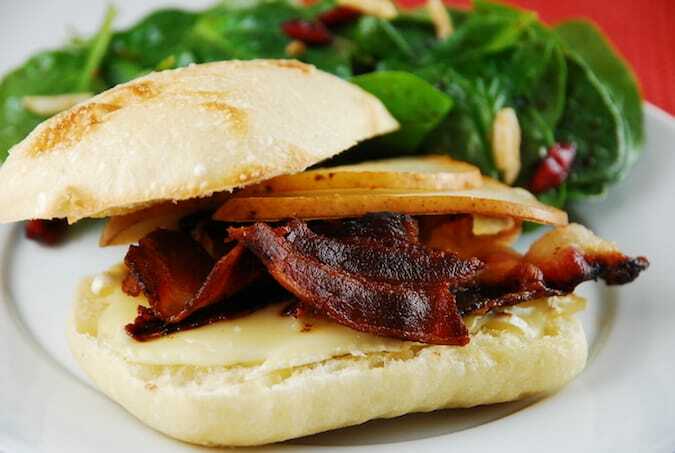 ), give this Bacon, Brie, and Pear Sandwich Recipe a try. The mild, creamy brie is perfectly accented with the salty bacon and sweet, juicy pears. It is truly an explosion of flavors that is divine. If you don’t like brie, and mild flavor cheese will work just fine. You can make this sandwich ahead of time, and then just heat up at the office. I also like to top it with some arugula whenever I have it on hand. Serve this with a light salad like my Cucumber Tomato Salad and or a 0 Points soup for a complete meal. Enjoy! Mouthwateringly delicious, this is one sandwich that definitely will add some pizazz to your lunchtime routine. The salty bacon tastes delightful with the sweet pear and mild brie. Pair it with some roasted vegetables and a low Points soup for a complete meal. Assemble sandwiches, distributing all of the ingredients evenly between them, and heat in toaster oven until cheese is melted. What are the points and carb count without the bun? Thanks! You have great stuff! The roll is 130 calories, 0g fat, 28g carbohydrates, and 1 g fiber, so you can just deduct that from each serving’s nutritional stats.